Here is another little piece of flash fiction for you. You are probably going to realize very soon why I normally stay clear of making up stories because I have no idea where I was going with this one. I was nominated for the TELL THE STORY Challenge by bereavedandbeingasingleparent, as you can see from his post below. The photo he gave me is the one directly below the title – that is my prompt, but because my story is a tad long, I am going to throw a couple more in to brighten this post up. There are days that I feel as if our games teachers should be working in a state prison. It’s frrrrrreeeeeeezing cold February, a chilled blast of wind rushing at you every few seconds, frost coating every blade of grass and adorning every spider’s web. Don’t you think on a day like today – we should be allowed to have our games lesson indoors in the school gym. But oh no! Miss Forster with that booming voice and shrill whistle shrieking at us in the changing rooms to hurry up and change into our athletics shirts and gym knickers and trainers and queue up outside the doors that lead over to the school’s outside sports courts and pitches. The only good thing about the sports field today was that the ground was hard and compact. I have endured too many cross-country circuits where we were all slipping and sliding through the mud and could barely stay on our feet. There was something about the fiercely cold wind that made me run faster than I had before. I think all of us girls were running faster than usual, and Miss Forster had a sadistic look of triumph across her face as she cheered us on whilst gripping her stop-watch tightly. 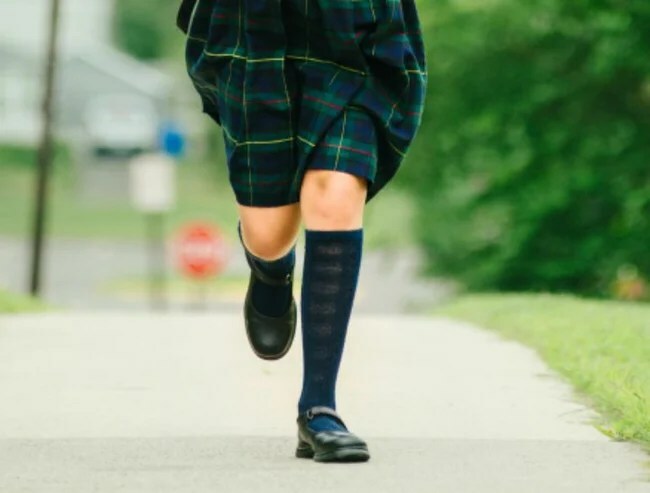 As I was running past the tennis courts for my last lap around the fields, I noticed that funny girl Emily who was in her uniform with her school coat on. Emily kept to herself, she didn’t seem to want to join in with anyone else. Emily always had a sick note for physical education, she never seemed to take part in games lessons. She didn’t play any sports or do any athletics or running. She just sat or stood whilst everyone else had to take part. Emily was staring out through the frosted tennis court mesh fencing at the fields beyond. She had her hands wrapped around some of the frosty sections of the mesh fence and it looked as if she was about to hoist herself up to climb. She did! I wondered what she was doing! I saw Emily slowly crawl up to the top of the tennis court fencing which was probably a good ten feet high. Then she swung her legs over the top of the fencing and dropped down to the other side. And then I saw something I had never seen before. Emily Rogers began to run. She did not look back, I could see her powerful strides as she galloped across that field as if her life depended on it. I have to admit there was something inspirational about witnessing Emily’s escape. Every single one of us girls were feeling hard-pressed to be made to run around the school sports fields in our gym-knickers. We would have loved to escape, but it was Emily who had done it. Emily Rogers who nobody had ever sen run before…she was now fleeing as fast as her legs could take her. So now it is my turn to tag three other bloggers to take part in the TELL THE STORY Challenge. This is the photo I am providing – it is a plunge pool from the ancient Roman spa baths in the English city of Bath. …when I started writing about school cross-country in the bitter cold, I had no idea Emily was going to crop up part way through the story and become the star of the story! Well – memories of school cross-country in the cold were very much my influence. Emily is fiction…I have no idea where she came from! She just popped into my head part-way through. I liked this story because it struck a chord with me. I was really bad at games and used to try my best to get out of the PE and games lessons at school. So Emily has my support and sympathy. Aaaaw Tanya! I envy anyone who managed to get out of school cross-country on bitterly cold days! Hi CC, do I have to continue the story you have written using the picture of the roman baths? Ok, just sorting out mortgage, and pretending to work, I’ll get on it later!! I’ve got an idea but it’s the teacher I’m interested with first of all, Emily will feature!! Then I have to nominate 3 folks yes? Yes exactly, pick a photo yourself and tag three other bloggers. I’ve done it but I’m never sure if my ping backs work, did it arrive in your inbox? Yes it worked … and I love it! Hope you have a wonderful weekend, free of mortgage worries! This is so good. Almost feels like nonfiction. The fffrrrrrreeeeeezing cold cross country was very real!!! Happened many times! I visited the Roman Baths on my one and only visit to Bath a number of years ago, so I’m looking forward to crafting a story. And I enjoyed your flash fiction piece. Look forward to your story Fandango. I very much enjoyed the prompt and I’ve realised that whatever the prompt is I can make it my own!! Sweet dreams.